Last week, a flyer was stuck to my garage door, describing Friday as a free E-Waste pick-up day. It said that there was no limit, and they would take old monitors, computers, appliances, metal tools, and other assorted items of that nature. All I had to do was take all of my old junk, put it out on the driveway, and attach the flyer with my name and address, along with the number of old monitors and TVs I was getting rid of. I decided to do it, and it was amazing how much I was able to unpack from my garage. There were 6 monitors, 9 old computers, a rusted, broken down lawnmower, a defunct weed whacker, and something that I think was probably a vacuum cleaner. It was hard to tell, since there wasn’t much there. While I was unloading all of this old tech from my garage, I saw my old Apple IIgs sitting off in a corner. I didn’t put the Apple out on the driveway. Instead, I took it to my dining room and set it all up on the table. The stockpile of technology that I’d set outside had been acquired in the last decade. Some of it worked, but most of it didn’t. Computers have a short half-life. It only takes a couple of years for them to become dated, slow, and undesirable. This Apple, however, still works perfectly. All of the disks I have for it still load. They keyboard is easy to type on. This thing is nearly 30 years old, and it runs as it always did. It can’t last forever, though. Nothing lasts forever. My Apple still runs now, but it might not function next year, or next month, or maybe even tomorrow. Yesterday, I fired up Appleworks and started opening up the stories I wrote a long time ago. The million words of crap you need to write before you become good? I strapped on some long gloves and went elbow deep into my pile. 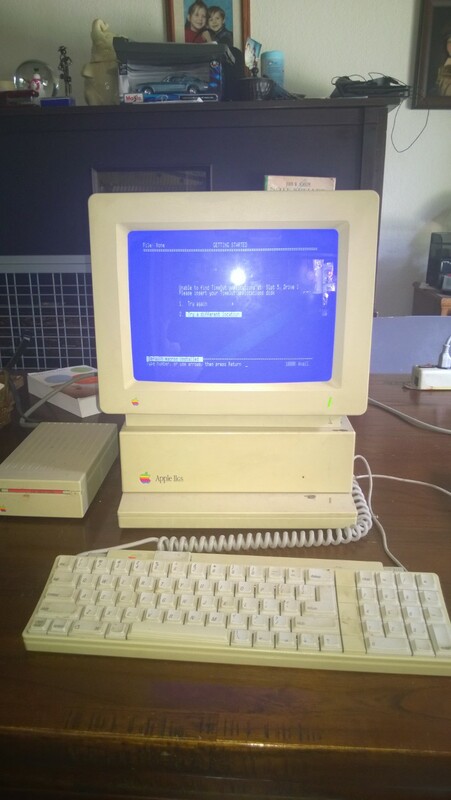 I have my Surface Pro 2 sitting in front of the Apple IIgs, with the Apple’s keyboard just off to the right. I occasionally reach over to the Apple keyboard in order to page down, while I transcribe all of my old writing into Scrivener. My Scrivener project is saving into a Dropbox directory, so I’m taking the stories I wrote in my teens and twenties and preserving them, such that no single piece of hardware can fail and erase it all. I’ve learned quite a bit from this exercise. I write very clean first drafts. This isn’t to say that they are good, necessarily. They’re just grammatically more polished than a lot of first (or even second or third) drafts I’ve read from other authors. I thought this was a skill that I had picked up over the years, while writing my million words of crap. One of the stories I transposed yesterday is unfinished first draft, and it was actually very easy to read, with strong verbs, minimal adverbs, and decent description. My Arthur Kane stories are as bad as I thought they were. This was the first book I wrote, which is about a genius, acrobatic, martial arts wielding, sharpshooter private investigator that lives on the moon in the early 2070’s. The book is three of his cases strung together, each case being about 20,000 words in length. The plot is contrived, the characters are unbelievable, and the details are impossible. This is not a story I want to share with anyone, ever again. The Arthur Kane stories are bad, but I was a pretty decent writer for my age. There are places throughout where I did things right. There are decent metaphors. There are decent story arcs, and I was not afraid to really abuse my protagonists. Looking at where I started, I can see how far I’ve come. The kid that wrote the stories that I’m transcribing had a lot to learn, but he also had a great deal of potential. My ability to write and tell stories has progressed, and this exercise has given me a tangible measure of that progress. So far, I’ve only transcribed a fraction of what I’ve written. This is going to take me a while. Maybe I’ll do something with these old story ideas someday, but probably not. I have new stories to tell. I don’t want to spend all my time rewriting. I’m taking the time now to just preserve what I’ve already written, and keep this very important point in my life alive, so that I can continue to measure my growth as I go forward.